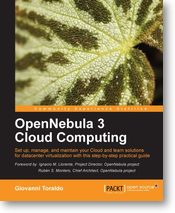 Open Nebula documentation is quite clear and is full of great examples so it’ll help you to install your cloud, but you may find useful this book published by Packt: OpenNebula 3 Cloud Computing by Giovanni Toraldo. I read it after installing my Open Nebula (I’m preparing my guide for CentOS and Open Nebula 3.8 ) and it helped me to understand better some Open Nebula concepts. I read the first six chapters (in my Safari Books subscription) and in my opinion the writer provides a fine step-by-step guide to get your cloud infrastructure running with many different hypervisors and storage options. If you use the book to install Open Nebula and you’re an Ubuntu user you just can copy/paste the apt-get install commands, but don’t worry if you use any other GNU/Linux distributions you’ll only have to find the right packages for your favourite distribution. As OpenNebula is evolving quickly you’ll find that some commands shown in the book have different parameters (I think the author used the 3.4 version), but with little effort you will be able to follow the guide for the 3.6 version. And you’re done! … but I have one problem. Thanks to this post at Binary Bit Me blog, I found that the bridge compatibility mode (brcompat) is not longer needed if you use libvirt >= 0.9.11 but CentOS 6.3 offers you 0.9.10 version 😦 so why not compiling libvirt and virtual manager tools as well (maybe I can test it later)? It’s quick and easy using the README and INSTALL files. Download libvirt from the libvirt web site or with git. You’ll need some CentOS packages. You have all the information in the Antarktikos blog. libxml2-devel is also needed. Thank you Kolmis. Download virtinst from Virt Manager web site, and use python to install them. And here’s my virt-manager running!. In a few days… OpenNebula will run in my N40 Lab.